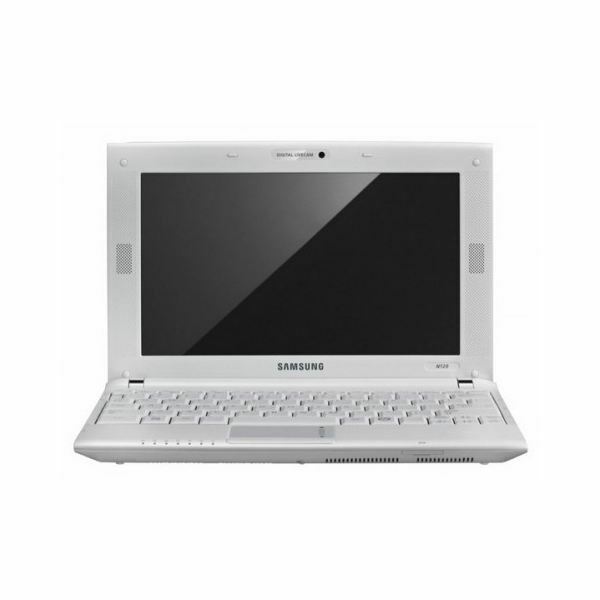 The Samsung N120 is the latest netbook by Samsung to hit the market. Samsung’s netbook journey started with the hugely popular NC10 and has now moved on to the N120. The N120 is very similar to the NC10 but offers some improvements like a roomier keyboard and slightly better speakers. It also offers a very stylish design and a very long battery life. In this review, we shall check out the Samsung N120 and see how it fares against the other netbooks in its price range. The Samsung N120 sports a very stylish design which resembles the Samsung NC10. It is available in white and black; both of the color schemes look very appealing, but I prefer the white version. The N120 is slightly bigger than its predecessors with dimensions of 10.7 x 7.4 x 1.2 inches but weighs the same at 2.8 pounds. It is one of the slimmest netbooks available. The build quality feels very robust and durable. The Samsung N120 comes with a standard 10.1 inch display with a native resolution of 1024 x 600 pixels. The display quality is very nice, and the brightness and contrast levels are also commendable. The colors are also vibrant and real. The sunlight legibility of the Samsung N120 is average; its display looks best indoors. The viewing angles of the display are also not very wide. It’s a nice display overall, suited to watching movies while on the go. Above the display is a 1.3 MP webcam which has average video capture quality that should suffice for casual web chats and video calling. The speakers mounted beside the display offer great sound quality. They have loud volume levels, and the sound quality is also pretty good. Listening to some music once in a while shouldn’t be a problem. The Samsung N120 sports a standard full sized keyboard which is a great improvement over some of the heavily cramped keyboards most netbooks offer. It is probably the best netbook keyboard around, better than even the HP Mini series. The keys have a nice feel and offer good feedback; the key spacing is also very good. The touchpad is located just below the keyboard. It has a very smooth surface and is very responsive. It also has nice sensitivity and is easy to get used to. On the right of the touchpad is a vertical scroller, and below it are the two mouse buttons on a single bar. The Samsung N120 offers nothing new in terms of hardware or operating system (OS). It sports the usual hardware combo: Intel Atom N270 clocked at 1.6 GHz, 1 GB DDR2 667 MHz RAM, and a 160 GB SATA HDD at 5400 RPM. It has the Intel 945 GSE chipset found in every other netbook. The graphics department is handled by an Intel GMA 950 with 128 MB VRAM. It is powered by Microsoft Windows XP with SP3. This configuration is good enough for doing basic activities like editing documents, surfing the web, playing songs, and watching movies. Don’t expect to use it for processor intensive tasks like video conversion or image rendering. However, you can also play basic games on this machine if you want. The N120 comes loaded with a lot of expansion ports; it offers three USB 2.0 ports, ethernet, headphone, microphone, a VGA port, and a 3 in 1 card reader. It also comes with Wi-Fi 802.11 b/g and Bluetooth 2.0 with EDR. The Wi-Fi data transfer speeds are pretty good, much in line with other netbooks at about 20 MBps. It has a 5200 mAH 6 cell battery which gives it about seven and a half hours of battery life with standard usage, more than the NC10. You can stretch the battery life by much more if you lower the display brightness and switch off the Wi-Fi. All in all, the Samsung N120 offers a complete netbook package, the best you can get in this budget range. Definitely recommended.